I can be difficult to pick out a gift for the coffee lover whose kitchen is already full to bursting with specialty mugs – if you don’t want to add to an overcrowded mug cabinet – but there are some coffee-themed options out there besides mugs. This Coffee Trivia Card Deck is one of them and coffee lovers will get a kick out of it because it will help to give some of their friends a crash-course in Coffee 101. 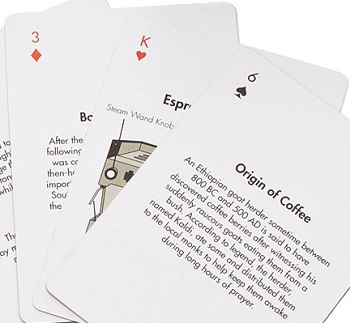 The deck of cards is a standard deck, and each card has a bit of coffee trivia, history or a recipe on the face where you would normally see the suit (the suits are still in the corners of the card, so your poker games can continue as usual). It’ll put you in the mood for a bit of gambling with those free UK bonus codes going around, put a fresh cup of coffee and just might make some friends see why you like it so much. Especially if you already have some brewing when you’re dealing out cards to set the mood!